international publications - website-layouts Webseite! Professor von Eiff is Guest Associate Editor of the internationally renowned journal "Frontiers in Public Health" and responsible for the section "Health Economics". 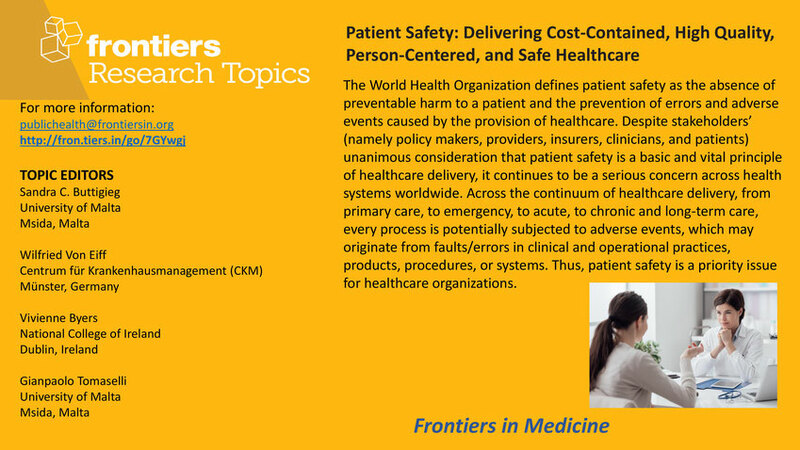 A special focus is on research around the topic of "patient safety" (in the sense of WHO's far-reaching definition). Researchers are invited to submit the results of their research for publication. A funding programme is currently underway, which gives young scientists in particular the opportunity to submit an article for publication free of charge. This book discusses current health care challenges and new strategies for innovative solutions in this area from an interdisciplinary perspective of health care management, business economics, and medicine. It presents the idea of a “boundaryless hospital”, a conceptual model of a patient-centric, value-based health network that overcomes typical sectorial, organizational, and geographical boundaries and offers greater efficiency and better quality outcomes for patients. Effective health care for a growing and aging population is a major challenge for economies all over the world. New breakthroughs in medical technology and pharmaceuticals as well as digitization provide scope for more efficiency and for a better quality of health care. Novel organization forms and management concepts are key for coping with the increasing cost pressure observed in most health care systems. The contributions in this volume present innovative strategies for developing and implementing the concept of a boundaryless hospital. They highlight experiences from various countries and with different treatments. Significant variations in the quality of health care management practices are present both within and across local, regional, and international health systems. With increasing globalization of health services, both quality and efficiency of care can benefit from shared learning on a regional and global basis. Although systems and quality of health care delivery differ across the world, empirical research has found that people involved in health care, whether in the role of patients or health care providers, have similar wants and needs. Identifying and documenting best practices within and across countries is more important than ever. Best practices in health care management organize clinical and administrative processes in ways that achieve leapfrog results as compared to normal standards in industry, potentially earning brand status. Advances in Health Care Management Volume 17 helps to shape emerging thinking about best practices in international health care management. The volume is divided into two sections: a set of commentaries from US and European scholars, and research articles that compare two or more health systems and focus on specific topics in health care delivery. von Eiff, MC, von Eiff, W: Lean Process Management in the Emergency Department: The Five Forces of Success, In: Portugese Journal of Public Health, 36/S1/18, Page 28.
von Eiff, W.: Network Management: Strategic Option for the Boundaryless Hospital, In: Albach, H.; Meffert, H.; Pinkwart, A.; Reichwald, R.; von Eiff, W. (Eds. ): Boundaryless Hospital. Rethink and Redefine Health Care Management. 2016. Springer Verlag. Berlin Heidelberg. S. 3-20.
von Eiff, M.; von Eiff, W.: Role and Function of the Emergency Department in a Boundaryless Hospital: Optimizing the Process Flow, In: Albach, H.; Meffert, H.; Pinkwart, A.; Reichwald, R.; von Eiff, W. (Eds. ): Boundaryless Hospital. Rethink and Redefine Health Care Management. 2016. Springer Verlag. Berlin Heidelberg. S. 211-234. 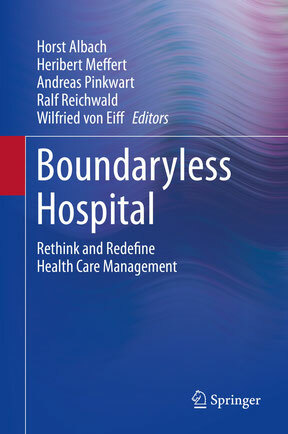 Haking, D.: Infection Prevention Networks and the Role of the Boundaryless Hospital, In: Albach, H.; Meffert, H.; Pinkwart, A.; Reichwald, R.; von Eiff, W. (Eds. ): Boundaryless Hospital. Rethink and Redefine Health Care Management. 2016. Springer Verlag. Berlin Heidelberg. S. 211-234.
von Eiff, W.: International Benchmarking and Best Practice Management: In Search of Health Care and Hospital Excellence, In: Buttigieg, S.; Rathert, C.; von Eiff, W. (Hrsg. ): International Best Practices in Health Care Management (Advances in Health Care Management Volume 17), Emerald Group Publishing Limited. S. 223-252. Buttigieg, S.; von Eiff, W.; Farrugia, P.; von Eiff, MC: Process Optimization in the Emergency Department by the Use of Point-of-Care-Testing (POCT) in Life-Threatening Conditions: Comparative Best Practice Examples from Germany and Malta, In: Buttigieg, S.; Rathert, C.; von Eiff, W. (Hrsg. ): International Best Practices in Health Care Management (Advances in Health Care Management Volume 17), Emerald Group Publishing Limited. 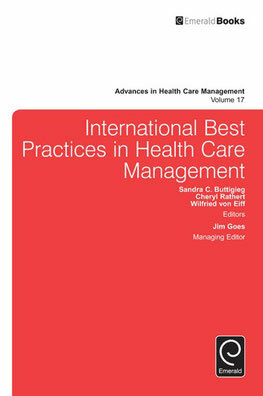 S. 195-219.
von Eiff, W.: International Benchmarking and Best Practice Management: In Search of Health Care and Hospital Excellence, In: International Best Practices in Health Care Management. Published online: 24 Feb 2015; 223-252. Doi: http://dx.doi.org/10.1108/S1474-823120140000017014.